Named for the number Bradshaw wore on his Pittsburgh Steelers jersey, Circle 12 Ranch is located just 70 miles from Dallas/Fort Worth International Airport in Love County within the Red River Valley of Southern Oklahoma. The physical address, 18501 Bradshaw Lane, Thackerville, is about an hour and fifteen minutes from DFW airport. The working equestrian and cattle ranch’s 744 acres is primarily improved grasses with a gradual elevation change. The ranch overlooks the Red River and has miles of frontage along adjacent Corps of Engineers-managed property. 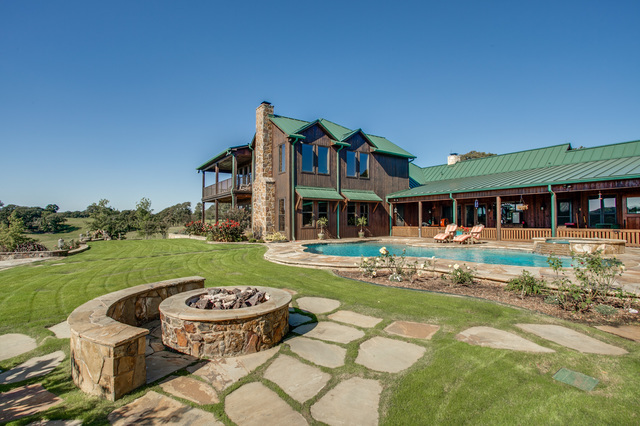 Eight ponds and small lakes situated throughout the property provide water for hay production, cattle, and horses. The 8,600-square-foot main residence, built in 2002, features rustic styling, with wood paneling, tile floors, and tall ceilings. Six bedrooms, six full and two,half baths, three oversize fireplaces, and a 1,000-square-foot patio with an outdoor kitchen, bar, fireplace, sauna, fire pit, and a large pool make it spacious and comfortable for multi-generational families, entertaining or corporate gatherings. A winding paved asphalt road from the gate to the main house provides easy access for vehicles. There are numerous internal trails throughout property for walking, ATV, four-wheelers, and horseback riding. Horse facilities include a four-stall stallion barn, a 20-stall show barn with tack room, and wash area. The 50-stall mare barn has a laboratory and office as well as a 75-by-14- foot covered arena. Also on the ranch are working cattle pens, alley ways to all barns and pens, structures to store farm implements, a four-horse walker, a separate hay barn and show pig barn, and a two-story dog house. There is also a main office with kitchenette, bathroom, and fireplace. The ranch lands are a quiet retreat space, but those looking for livelier action will be glad to note the nearby WinStar Casino and Resort. One of the world’s largest casinos, it also offers golf, spa services, and world-class entertainment (upcoming in the next month–Willie Nelson, Jerry Seinfeld, ZZ Top, and Celtic Thunder, for example). Lake Murray is situated 25 miles north of Thackerville. Created in the 1930s, the 6,000-acre lake was Oklahoma’s first and largest state park dedicated solely to recreation. Falcon Head Resort an Country Club, 15 miles northwest of Thackerville has hosted both LPGA and PGA tours. Bradshaw floated the house for sale in 2012-2104 at $10.8 million, later withdrawing it from the market. It’s back on the market again at $ 9.95 million represented by Bernard Uechtritz of Icon Global Properties. Did he once own a horse ranch in Grierson, Louisiana? I grew up in the area and was always with the belief that he did. At the time he was married to JoJo. When can i move it? would love to own this house1 I am a true country girl, who never had much.But i could not pay the bills!